Review: Years ago on a stormy night, when Yuki still was a little girl, she was attacked by a vampire. However, she was saved by Kaname, who is a rare pureblood noble vampire. She doesn’t have any memories of her life before that fateful day and was adopted by the headmaster of Cross Academy. She now attends this school as a day-class student. This school also has a night-class which consists only of beautiful and talented students. Only Yuki, her adopted brother Zero and the headmaster know that everyone in the night-class actually are vampires, trying to conform to human society. Kaname also attends this class and as a pureblood he tries to keep everyone civilized. However, even he seems to have certain secrets. And what are the secrets behind Yuki’s and Zero’s pasts? 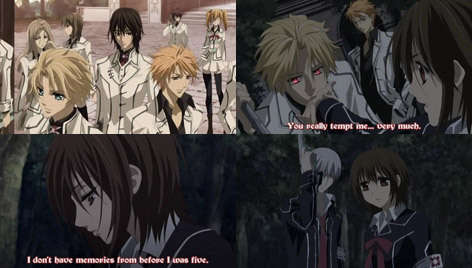 Vampire Knight is based on a popular manga with astonishing artwork. The anime show’s animation quality doesn’t quite live up to that, but at least it by far isn’t as much of a let-down as Special A. It’s a shoujo story about the love triangle between Yuki, Zero and Kaname, which gets more complicated by the fact that they are both vampires. But even plot-wise this show doesn’t fall short with all its mysteries and tragedies that unfold along the way. Even those who do not like shoujo anime should give this show a try. Review: Every person has an invisible ring around his neck. This ring will get darker and darker and he will die once the ring has turned black. Ever since birth Kita Michiru was able to see those rings. She is shocked when she finds out that the rings around Akatsuki Chika’s and Tachibana Shito’s neck, two boys from her school, are pitch black and yet they are still alive. When she gets involved with them she learns that they once died and were given another chance by the Zombie Loan project. She decides to help them to repay their debt by killing zombies. I’m not sure if a zombi horror setting is the right thing for a shoujo story, but at least it’s something new, even if it’s nothing for me. Review: Risa is very tall for a girl, while Otoni is very short for a boy. Both have very similar personalities and share many common interest. Still they always fight with each other and make fun of one another. Despite that they hang around each other all the time und understand each other well. Their friends tell them they should just date, but instead of this they make a bet on who will get a boyfriend/girlfriend first. This anime and its characters are just hilarious. There are many well placed, sudden and unexpected twists and turns. Comedy and romance are well balanced and it all perfectly adds up. Review: This OVA series is based on the popular shoujo novel series of the same name and continues where the first 2 popular seasons Maria-sama ga Miteru (08.01.2004 till 01.04.2004) and Maria-sama ga Miteru: Haru (04.07.2004 till 26.09.2004) left off. Fukuzawa Yumi is a cute first-year student at Lillian Girls’ Academy. This catholic school has a special student council that is admired and famous among all the students. Usually this student council is composed of 3 senior students who take special flower titles: Rosa Gigantea (white); Rosa Sinensis (red); Rosa Foetida (yellow). Each of them can take a second-year student who then is referred to as “Rosa … en bouton”. Each “en bouton” is also allowed to pick a first year as a “petite soeur” (little sister). The 9 girls hold meetings in a special small house on the school grounds. Sachiko, the “Rosa Sinensis en bouton”, suddenly asks Yumi, who has always admired her, to become her “petite soeur”. This romantic, dramatic and heartwarming story revolves around the lives of the 9 girls of the student council and focuses on their relationships and circumstances. Review: Takahashi Nanami just got into high school and she is looking forward to a happy school life and making lots of new friends. The other girls tell her about Yano Motoharu, who is popular with the girls, always class president and seems to be a perfectly successful nice-guy. However, as Nanami has the chance to get to know him personally, he seems to be like a mean, teasing and careless person. When they both get elected to be class president and vice-class president, they start spending more time together and she start to see Motoharu’s kind a caring side. Is she starting to fall for him? And what kind of sad story is behind the death of his former girlfriend? Will he be able to fall in love again? 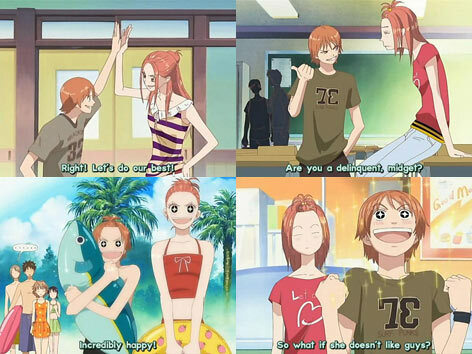 Bokura Ga Ita is an enjoyable shoujo romance story taking place in high school surroundings. It seems like a pretty generic shoujo, but has certain qualities to it that make it interesting to watch even for those who usually don’t watch many shoujo anime. Review: Ouran Academy is a big and fancy high school that only rich people attend, except Haruhi who is a common girl who won a scholarship. She does not care much about fashion and is often mistaken for a boy because of that. When accidentally visiting the clubroom of the Ouran Host Club, she breaks an 8 million yen vase. Now she is forced to join the club in order to repay her debts. 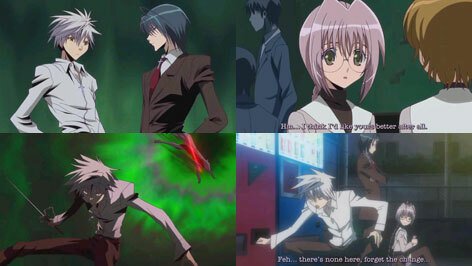 The Host Club makes money by getting female visitors, keeping them company and entertaining them with their boyish charm. After styling Haruhi, the members realize that she look somewhat extraordinarily cute and soon they realize that she actually is a girl. Still she has to dress up as a boy and entertain the female guests in order to repay her debts. Ouran High School Host Club is a funny and entertaining anime that deals with the daily life of Huruhi and her super funny Host Club members. See how rich people get all excited about things that are normal to commoners like for example instant coffee.